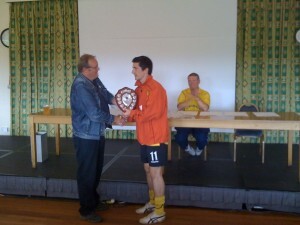 With the 2011/12 season now drawn to a close, the end of season stats have been updated and there’s a unique double achievement for Joel Moody, who becomes the first player in club history to be the leading appearance maker and top goalscorer in the same season. 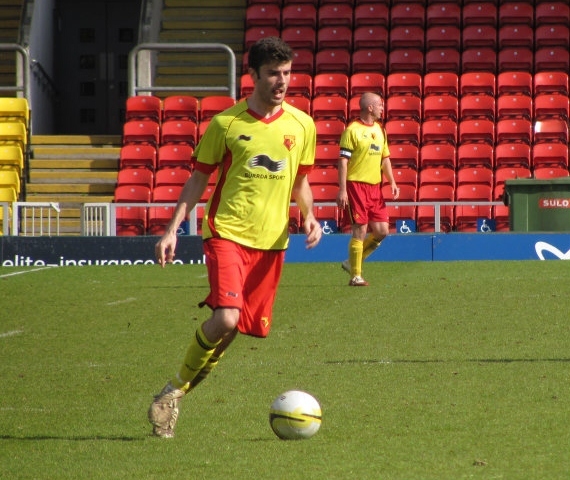 Moody’s 13 goals in 28 games kept him ahead of Dave Soloway in the scoring stakes and Stu Nicholls in the appearances. A full list of 2011/12 stats can be found here. All of the overall totals can be found here. Both WIFC teams were knocked out in the first round of their respective competitions at the weekend, but as ever that failed to detract from a hugely enjoyable weekend in Leeds. The highlight of the Friday evening saw WIFC presented with the Team of the Year award for a record fourth time, followed by some stirring debut songs and a rousing rendition of the Music Man and other songs in the Bod Bar. In what may be the last Worldnet, certainly in it’s current format, the WIFC A team again raised expectations of a successful run by winning their group on Saturday. The first game saw WIFC take on Portsmouth and after a close first ten minutes in which both teams had chances, Joel Moody opened the scoring for WIFC, slotting home after rounding the keeper for his first ever Worldnet goal, on his 6th visit to Leeds. Dave Soloway added a second, while Chris Dew’s thumping header after the break completed the scoring. In their second game, WIFC took on AFC Telford United for the first meeting between the two. Despite dominating posession, WIFC went behind but drew level when skipper Chris Dundon bundled home from close range. The Shropshire side weren’t to be denied, and they grabbed a late winner to leave the Internet ‘Orns needing a win in the last group game against Coventry to ensure progression. WIFC duly secured it with a comfortable 2-0 win against the Sky Blues, with further goals from Moody and Dundon. Meanwhile, the Vets team took to the pitch with a first match against Leeds. It was the Yorkshire side who drew first blood, but WIFC forced several corners in a period of dominance and from one of these, a foul was punished with a penalty kick. Unfortunately, Lee Evans skewed the kick wide and Leeds held on for the win. Looking to bounce back in their next game against Airdrie, the vets again conceded but didn’t let it dampen their spirits and another dominant spell produced more chances and another penalty. This time, Panos Fellas coolly slotted home. Looking to press on for the win, it was the Scottish side who grabbed a late winner. Keen to ensure at least one win and a kinder tie on Sunday, WIFC took on old friends West Ham in the last game. There was no mistake this time and Paul Withey opened the scoring in the first minute, while Lozza Wells and Steve Eustice added further strikes before the break to secure a comfortable 3-0 win. After an evening sampling the delights of Leeds and plenty more singing in the hotel bar, WIFC approached the knockout phases of the weekend in good spirits. The Vets were up first with a 9am start and went down to a single goal against Oxford despite a solid team display. The A team were reunited with AFC Telford and after a close first-half, the team produced it’s worst 15 minutes of the weekend and went down to a 2-0 defeat. 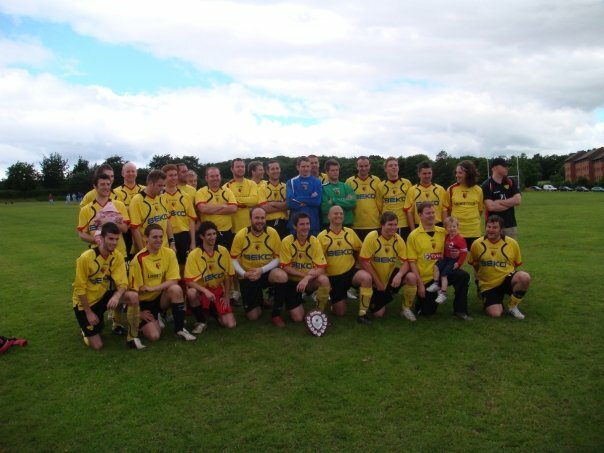 With rumours over the weekend pointing to the two tournaments being hosted separately, it remains to be seen what next year will bring, but WIFC will now take a short summer break, returning for the new league season in September. WIFC are celebrating once again, having been named the IFA Team of the Year for the fourth time in the 15 year history of the club. The award, which is voted for by the 80-odd clubs across the UK who make up the Internet Football Association, is given to the side who have displayed the best team spirit and are considered the most sporting side and most welcoming hosts. The IFA league is made up of teams who travel around the country to take on fellow supporters’ sides, usually between clubs whose first teams are competing that afternoon, and WIFC have been leading lights in the IFA since their inception. WIFC, who were also beaten IFA London Cup finalists this season, will have a first team and vets side taking part in Worldnet this weekend. The annual event, which takes place in Leeds each year, is seen as the pinnacle of the IFA and Messenger is hoping that the Team of the Year crown will be their lucky omen. “Last time we won team of the year, we went on to reach the Worldnet final for the only time in our history. Hopefully we can go one better this year, and bring two pieces of silverware back down the M1” added Messenger. WIFC joint managers Chris Davis and Dave Messenger, and Vets manager Pete Fincham are pleased to finally announce the squads for Worldnet 2012. With the largest number available for some years, the 16 and 22 man squads give both teams a great chance of emulating last season’s runs to the Quarter Finals of each tournament. More preview of WIFC’s trip to Worldnet, 15 years since the first, will appear here in the coming ten days. WIFC had a tough day at the office last Sunday as preparations for the annual Worldnet tournament in Leeds began in earnest at the Supporters Direct tournament in Enfield. WIFC didn’t really get going during the first two games, and by the time the team finally got a win under their belts in the final game, their fate had already been decided. The draw was always tough and pitted WIFC against London Cup winners West Ham in the opener. In a tight game chances were few and far between, with Dave Soloway spurning a great chance to get the tournament off to a flier. Having matched the Irons well, WIFC conceded a disappointing goal to a set piece in the last few minutes and went down 1-0. After a two game break it was time to face Barnet, who had beaten Carlisle 4-0 in their opener. Having seen West Ham surprisingly lose 2-4 to Carlisle after a red card reduced the Irons to ten men, the group was wide open. Sadly, WIFC couldn’t take advantage and struggled to get a grip on the game. The Internet ‘Orns never really threatened going forward until two goals down, when Soloway showed better finishing to take advantage of some indecisive defending on Barnet’s part. WIFC threw everything forward in search of an undeserved draw, but it proved to be too late to mount a comeback. WIFC faced Carlisle in the final game, and were able to step up their performance level, keen not to go out without troubling the scorers. A long range free kick from Ben Pegram gave the Internet ‘Orns a 1-0 lead at half time, while two second half headers from Rob Sterry from great crosses by Pegram and Stuart Nicholls gave WIFC a fairly comfortable 3-0 win. “As preparation for Worldnet, with the team not having played together for some time, the day served it’s purpose and we were able to shake off some cobwebs” said joint manager Dave Messenger. “It’s always tough to adapt to the 30 minute game format and the way these games went, especially the West Ham match, gave us all food for thought as we approach Leeds. We know what’s required, and we’ll work towards this when we take on Stevenage in our last warm up next weekend” added Messenger. Barnet went on to win the group, despite a 3-5 reverse against West Ham in the last match. They met AFC Wimbledon, winners of the 2nd group containing Stevenage, Cambridge and Enfield, and the Wombles lifted the trophy after a 1-0 win the final. Squad – Richard Walker, Phil McBride, Ed Sterry, Matt Ainsley, Stuart Nicholls, Dave Messenger, Matt Ball, Frank Smith, Lee Evans, Martin Owen, Panos Fellas, Simon Jones, Joel Moody, Ben Pegram, Dave Soloway, Rob Sterry.